Click here for audio of Episode 1676. Today, some very-old bells with a surprising secret. The University of Houston's College of Engineering presents this series about the machines that make our civilization run, and the people whose ingenuity created them. 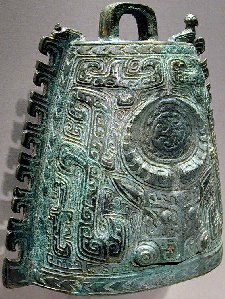 Just after 1900, archaeologists began finding curious sets of bronze bells in tombs throughout China. They ranged from two thousand to thirty-six hundred years old, and they looked like truncated cones that'd been slightly squashed. They're shaped a lot like our cow-bells, but these had no clappers. They were struck. They're called Zhong bells and, though thousands had been found by the late 1970s, they had yet to reveal their secret. Players from China's National Music Research Institute almost caught on when they did concert on a set of these bells in 1957. They were working on a piece with the unpromising title The East is Red, when they were dismayed to find one of E-bells missing. Then a player chanced to notice he could get that E by striking the C-bell on its side. The C-bell apparently just happened to give two tones, a third apart. 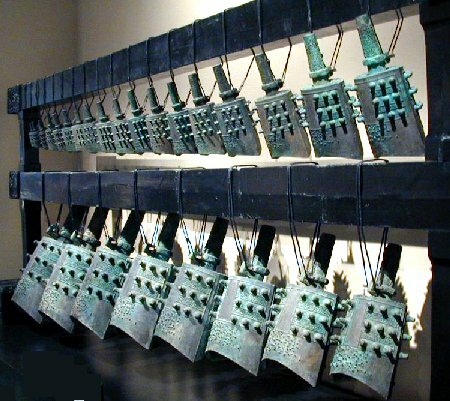 Twenty years later, as Chinese musicologists examined a set of these bells, they realized that every bell in the set did that. They all gave two tones, either a third, or a minor third, apart. In fact, a closer look revealed that many bells even had marks on the side where you should strike to get one note or the other. Every bell was, in fact, two bells in one. The importance of that discovery grows when we realize that it took the West a thousand years to develop the cathedral bell, and we didn't have it until the middle ages. Bells are very hard to make, yet China had these remarkably sophisticated Zhong bells during the Golden Age of Athens. The bells produce a rich tone, they take far less bronze to get it than a cathedral bell, and then they deliver two sounds for the cost of one. Acousticians are just now coming to understand how they work. Musicians are finding they were really quite hard to play. This high technology (which also took the Chinese a thousand years to perfect) died out completely during the Han period -- about the time of the first Roman Caesars. Once historians began piecing the record together, they realized these strange bells played a role beyond music-making. For consistency of tone, they were all tuned against a standard string. The consistency of their shape made them a standard of volumetric measure. The amount of bronze in each was so carefully controlled as to provide weight standard. Each set of bells was a mini-bureau of standards in ancient China. The greatest delight of science, or of history, occurs when an object or an event seems to be one thing, turns out to be something else entirely. We gazed at those remarkable, and seemingly unassuming, bells for eighty years before they revealed dimensions of sophistication we hadn't imagined. It makes me think of Isaac Newton hearing an apple fall in his back yard. Only an apple -- a common, completely uninteresting, apple. This is a greatly revised version of Episode 175. The Engines of Our Ingenuity is Copyright © 1988-2002 by John H. Lienhard.